In spite of the wet weather in Sydney, life on board Zenitude around the familiar harbor is good. We have settled in a mooring in Cammeray marina and are enjoying the quiet summer. Several friends that also crossed the Pacific last year are here, and we are meeting again with friends from our old times in Sydney. While all is good we feel the need to make a hard decision. Should we set sail again in April or should we settle down for a while and get back to life on land? In the end we felt we needed a break from sailing. We moved to a serviced apartment, went back to work, traveled the fast way and did a bit of city life in Sydney. Before leaving on a long land travel we decided to leave Zenitude out of the water, on the dry during our long absence. On March 6, Zenitude left Cammeray Marina towards Port Stephens. Oscar and Murray, our friend and companion during the Pacific crossing, left the mooring just before 11:00 AM for an 87 miles short trip to Port Stephens. They arrived in Shoal Bay at 2:30 AM and dropped anchor to rest and wait for daylight before continuing to Cove Marine in Oyster Cove. 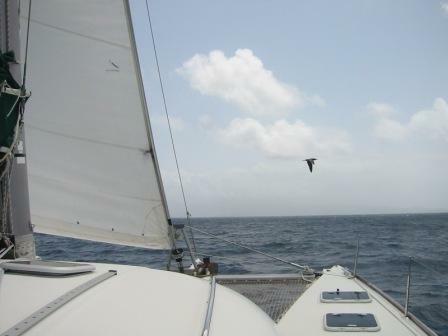 After leaving Sydney, the first part of the trip was good, with excellent following winds. When reaching Newcastle a series of squalls together with the cold wind made the last 20 miles quite miserable. It was also miserable wet with very poor visibility the next morning, making the 12 miles from Shoal Bay to Oyster Cove. The result is that they lost the tide's window to haul out Zenitude. Haul out had to wait for next day. Our idea is to leave Zenitude in Cove Marine, Port Stephens, in the dry, while we go overseas for 2 to 3 months. The plan is to do all needed work (antifoul paint plus all the small things in our two pages long 'to do' list) when we are back from overseas and before leaving for our next sailing season. After almost 6 months overseas we are back in Sydney. Zenitude is still in Oyster Cove, Port Stevens. Work on the boatyard has started last week with a complete peel off the old antifouling. Inside, Zenitude is a complete mess and we have lots of work ahead of us, as always, coming back and getting things into place again feels overwhelming. Oscar is back and forth between Sydney and Port Stevens and I'm doing my bit as I have started on a big project that's been waiting for me for a long time: a new bimini! Slowly we are trying to get back in shape and get Zenitude ready for a Summer in Sydney. 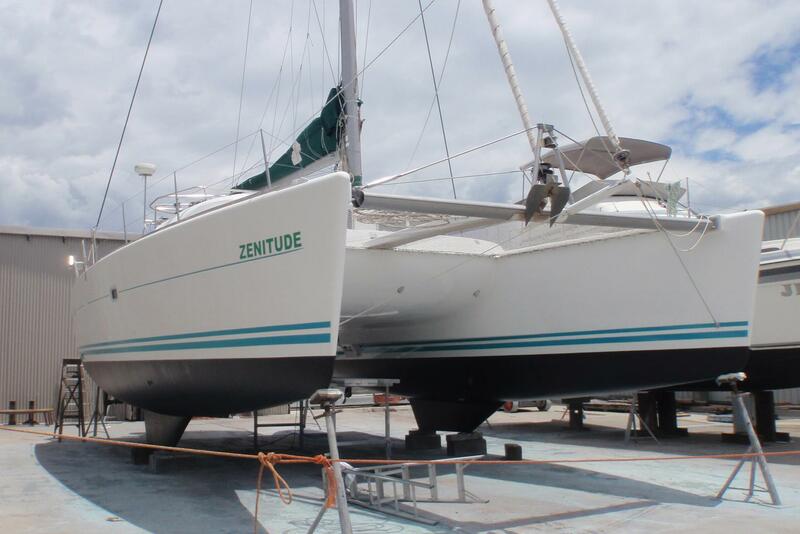 On November 20 work in the boatyard is finished and Zenitude with a renewed look is back in the water. 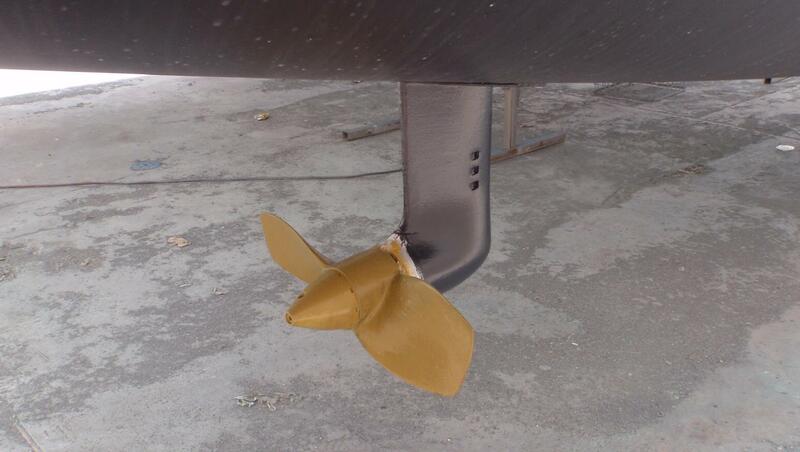 She had all the old bottom paint removed and replaced by new anti-fouling, including raising a bit the water line that was too low. She also had all the old stripes removed and replaced by new ones, polish and wax completes the new look. Sail drives are good. Seacocks are good except for one that is broken and needs changing. Oh well, always a worry, everybody is busy at the yard, nobody wants a small job so Oscar decides to do it himself. It is an underwater seacock so it has to be perfect if Zenitude is to stay in the water. Finally all is done, and she is down in the water happily floating again. Oscar has been looking around making inquires and found a great marina in Soldiers Point with a very good mechanic and electrician to continue with the overall maintenance work. So that is where he is heading all by himself as I'm still working in Sydney. Going along the channel is a bit stressful with just under 3 feet depth at high tide in some places, but he makes it to the marina. Soldiers Point marina is a great place to stay if you want to relax or get work done. Zenitude and Oscar arrive at the marina after leaving Oyster Cove boatyard and while the mechanic does his magic with the engines and the electrician with the battery bank, Oscar is busy working on the endless 'to do' list. We ended up loosing one of the batteries but finally got the new wind generator installed so now we are good with electrical supply, at least for the time being. The marina has excellent installations, there are 2 good restaurants and the people are very nice and helpful. I'm coming on the weekends while Oscar remains in Soldier Point. The plan was to stay a week on Soldiers Point but we had to stay an extra week waiting for a weather window, we need northerlies or easterlies to be able to go down to Sydney and we need that during the weekend as I'm working during the week days. In the meantime, in Sydney, work on the bimini continues during the little free time left, the deadline is sometime before Christmas, will it happen? Finally it seems that we can leave Friday for an overnight trip. The weather pattern has been pretty much the same, a southerly change every three days, we want to be in Sydney early Saturday ahead of strong winds and the cold front forecast for Sunday. It is Friday afternoon and after almost 8 months without seeing open waters Zenitude is leaving Nelson Bay on a 90 miles trip towards Sydney. She looks great and with a lot less paint in the bottom it seems she is a bit faster. Everybody is happy. But soon the busy area was behind us and the rest of the trip was uneventful. The wind started to die by sunrise and completely died 5 miles from destination. By 10.00 AM we were happily at anchor in Middle Harbor and by 3.00 PM we were back in our old place, Cammeray Marina. 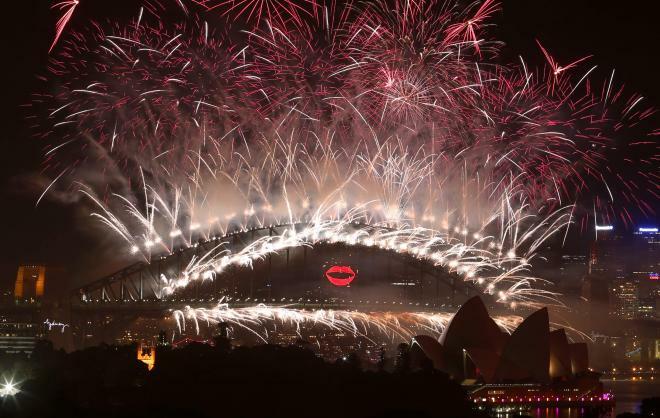 Now Zenitude is back in Sydney and we have plenty to do to get her ready, first for a family New Year's Eve party, then for the Summer and after that, well, we have big sailing plans but still some decisions to be made. Leaving Soldier Point's marina in the afternoon we knew we would need to negotiate Newcastle ship traffic at night time. We could have waited to leave at sunrise but decided to do a night trip and arrive in Sydney in the morning ahead of a southerly change. A bit stressful the night sailing as we had lost our Radar the week before, apparently a bad connection inside the display unit, and there is no signs that it can be fixed in the near future. As we always do around Australia, we logged our sailing plan with VMR and off we went, on a nice weather window, winds from the East first, backing to the North before nightfall. I have to admit we are a bit rusty for sailing and after gathering all stuff we forgot to prepare ahead of time we were happily out at sea again. By nightfall, a bit north of Newcastle we could see several cargo ships drifting, as they always do around that area. By the time we reached the port entrance it was night already. At our starboard side many lights showed ships at anchor, our port side showed ships drifting, luckily not many of them were moving. The few that were moving got us really confused. Without the radar we couldn't estimate the distance. One that looked really confusing turned out to be another sailboat going the other way, another ship was showing red light when all of the sudden did a 180 degrees turn (red and green and then just green) and ended up crossing with us, starboard to starboard, too close for comfort. She was big. Finished! I felt a mix of elation and worry when finally I sewed the last stitch of the project 'bimini'. Will it fit? Will it look good? A big question mark as I was sewing the bimini at home, away from Zenitude. I couldn't try it on. Installation took a little while, pushing here and there, until Oscar's hands were sore and the bimini in place. What a relief, finally done. Considering that we bought the material 3 years ago and the project was always on the things to do list, we felt good to be able to finally write 'done!' next to the task 'new bimini'. And our cockpit has a roof again. Christmas came rushing and the end of the Year is over us. Having spent many holiday seasons away from family we really appreciate when we can be all together, kids and grand kids. We enjoyed Christmas Eve in Melbourne, Christmas Day in Sydney and New Year's Eve in Zenitude, quietly anchored in Rose Bay, with kids and grand kids keeping us busy and happy.